Loud rock bands, jazzy combos and big bands, groovy funk organ trios, big Broadway productions…I’ve been lucky to back these groups and see the world in the process. I started out in band class at school and gravitated to the drumline early on. I liked the precision, strength, speed and volume of all those drums playing together. When I went to college to study drums and percussion more in depth at the The University of North Texas, I figured out that I enjoyed developing my hands and technique as much as I enjoyed learning about all different kinds of music. I’ve studied and performed on Caribbean steel drums, African drums and rattles, marimba, and afro-cuban drums - just to name a few. But my true love is the drum set. 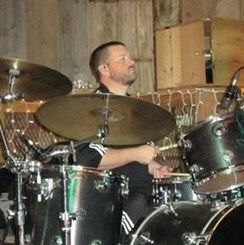 I love the feel of hitting drums hard and pushing the band with energy and precision. I also love playing a soft, swingin’ groove that allows a more jazzy group to ebb and flow on top a cool, breezy beat. I am very passionate about music and drumming and I look forward to sharing my experience and passion with you. In my free time, I play with my three crazy and fun dogs, Bailey, Ranger and Maverick, enjoy comedies of all kinds, true crime stories, thrillers (books and movies) and hanging with my wife, friends and family. And pizza, ‘cause who doesn’t like pizza?